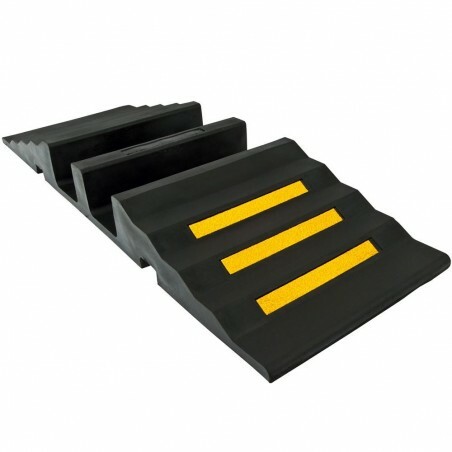 Protect master stream hoses or supply lines with these industrial-strength ramps. A 20,000 lb per axle capacity make them ideal for fire engines or other vehicles with supply lines in high traffic areas. Multiple hose ramps can be fixed together with the included connectors for protecting longer sections of hose. This Guardian 2-channel hose protector allows vehicles weighing up to 20,000 lbs. per axle to safely and smoothly transition over two master stream or supply lines. The hose protector ramp directs vehicle tires over the hose line to a center support, then over the second hose line back to the road surface without damaging or crimping the hose lines. Multiple hose ramps can be placed side by side and fixed together with the included connectors to create longer runs. Includes integrated yellow reflective strips on both sides for maximum visibility in all conditions. Ideal for fire engines and fire protection vehicles crossing supply lines or master stream systems in high traffic areas. Made with industrial strength thermoplastic rubber great for outdoor and indoor use. Please note: Must have 4" or greater clearance for proper use.